I love time lapse photography, but most of it is from a fixed vantage point. This example is pseudo-fixed, in that the camera is in fact mounted, but to a moving car, and it is driven from LA to New York in four minutes. The music is pretty cool too. Enjoy. Two weeks of mindless crap and art posts to go! Link: Amazing tilt-shift time lapse videos [Photography] — I Heart Chaos. OK, this stuff is really cool. I am trying to figure out how this is done. Think this will take off? I remember the first time I saw one of these. It was at a McDonald's in Anderson indiana. It was a dumb I idea I said. 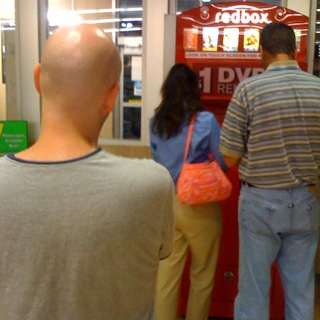 Now here I am 3 deep in line at the redbox machine. I was right. Props to Javier Bardem, Daniel Day-Lewis, Joel and Ethan Coen (although I thought PT Anderson deserved it more). No Country... didn't wrap things up as well as ...Blood did, but then, that might be what the academy liked better. Still, I like both movies. I have seen There Will Be Blood three times so far in the theater. I don't do too many film reviews here, but I highly recommend "There Will Be Blood." Along with "No Country For Old Men" (which I also highly recommend), it got 8 Oscar nominations this week. It's fortunate that Javier Bardem and Daniel Day-Lewis are not going head to head for the Oscar, because that would be a damned shame. They are shoo-ins in their respective categories, in my opinion. Interesting trivia...The score for "There Will Be Blood" was such a distinct character in this film that I had to stick around and find out who was responsible. It was Johnny Greenwood. "That's funny," I say to myself. "Johnny Greenwood is the name of Radiohead's lead guitarist." Yep, my sniffer still works. It is that Johnny Greenwood. And no, there's not an electric guitar, theremin, or Rhodes anywhere near this score. Go see this movie, preferably somewhere they turn the soundtrack up to 11. Movie trailers are lies! LIES! Check out this article by David Pogue in the New York Times. Not sure why I only now started noticing this. It has probably been done for years, but I definitely did notice it twice in the last two weeks - first with the movie "Dan In Real Life," and then second with the movie Pogue talks about, "National Treasure 2." If you've seen the trailer for Dan In Real Life, you will no doubt remember the scene where Dan and his girls are in the car, and his daughter pulls out into traffic and nearly crashes, and Dan says, "Student Driver!". Yeah, well that scene's not even in the movie, but I chalked that one up to editing for length and pace, which is done all the time. Trailers are often cut well before the movie actually releases, and probably even before it test screens. During test screenings, the audience is monitored, and if the producer/director don't like the reaction certain scenes get, they cut them out of the film before wide release. With "National Treasure" on the other hand, I find subterfuge afoot. Multiple scenes in the trailer appear in the movie, but seem to be shot from completely different angles, with different voice inflection, etc. It's almost as though they were filming the movie, and when they got a take for the film, they said, "Cut! OK, now let's do a take for the trailer." Personally, I don't mind cutting a scene out of a movie to tighten it up - I get that, and odds are the scene will show up on the DVD release as a "deleted scene." But this business of "shooting for the trailer" pisses me off a little bit. Pogue argues, and I think I agree, it borders on false advertising, making a film seem more intense, more funny, more - whatever - than it actually is.